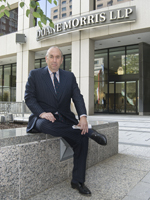 I recently spoke with The Philadelphia Inquirer about Duane Morris’ expansion and growth, particularly in Asia. Over the past several years, the Firm has opened offices in Singapore, Vietnam, Myanmar, Shanghai and, just last year, Taiwan. These offices have established the Firm’s Asia footprint, which helps position our efforts to support clients on a global scale. Against our exciting expansion into Asia, I can’t help but think back to the Duane Morris I joined in the 1970s, with our 70 lawyers—and all of them in Philadelphia! Now that we are an international law firm of more than 750 lawyers, it certainly makes for a very interesting comparison. As the Firm has grown, so has our alumni network. In this issue, we speak with Eric McCormick, who is senior counsel at Pernod Ricard USA. Even those who may not immediately recognize the name of this premium spirits and wine company will surely know its many ubiquitous brands: Absolut, Avion, Beefeater, Chivas Regal, Glenlivet, Jameson, Kenwood Vineyards, Kahlua, Malibu and more.